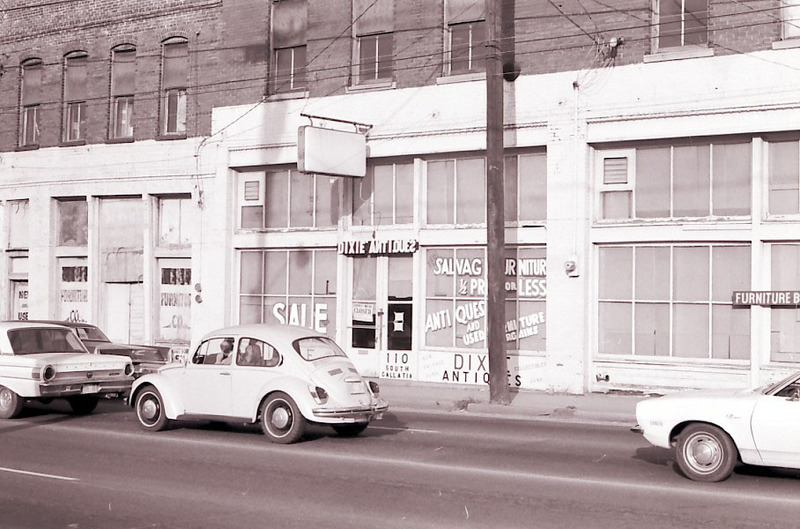 This is the site of Dixie Antiques, the original home of Trumpet Records, in Jackson, Mississippi, taken in 1974 by Hasse Andreasson. This entry was posted in 45 rpm, 78rpm, Americana, Blues, Gospel, Rare Records, Rhythm & Blues, Roots, Vinyl, You Tube. Bookmark the permalink. I have been looking for pics of the original. I was trying to find pictures of the original back in the 50s. My father, wally deane, http://www.wallydeane.com, recorded for Lillian in the 50s and was the great hope for lillian after her label was seemingly failing. Trumpet turned Globe Records. Are there any pictures of the record mart in the 50’s? If you can locate, please share. I share your passion in keeping one of the most influential recording labels in history, alive. A museum would be so awesome! Im so excited about what you are doing! I really am. I would live to know how things are going in this project. Tex Dean and Ginger Rody brought my father to Lillian in 53, from Miami. Wally was playing local Miami Hotel Shoremeade at that time. Lillian naturally looking for new talent, signed a contract with Tex and Ginger, for my father. I have all the contracts, recording studio, expenses, letters from Lillian to my father, and all the songs that were recorded under her label. Thanks to Vitrice, I was able to attain all rights to my fathers recordings left in the blues collection in Mississippi. She really liked wally’s sound. My father really enjoyed the black sound, and was regularly, sitting in in the black clubs late at night, even though he was not of legal age. Please let me know whats happening in this project. I have a true interested in the success of this studio and its rich history.